Red Dog, also known as Yablon, is a variance of poker and is a popular form of card game enjoyed at many online casinos. In comparison to traditional poker games, Red Dog is a single-player game, with players competing against the cards rather than each other. All cards in Red Dog are valued the same as in traditional poker. Ace is the highest followed by the King, Queen, Jack, 10, 9, and so on. The game is very much one of chance as opposed to skill and is basically a variation of In-Between or Acey-Deucy, both popular card games. At the start of the game, the player places an initial wager, with the dealer then drawing two cards, face-up. If the two cards in question are of consecutive value, such as a four and a five, then the hand is known as a ‘push’. If the two cards are of equal value, then a third card is dealt to the player. If the third card is of the same value as the first two cards, then the hand is paid out at 11:1 odds on the player’s initial bet. Otherwise, the hand is also a push. However, if the two cards dealt initially are not consecutive or of the same value, then the dealer will announce a spread. The spread is the number of cards which fall in-between the two dealt cards, for example for a three and seven the spread would be three. Once the spread is announced, the player must decide whether they think the next card dealt will fall in-between the values of the first two cards. If they believe the card will fall within the spread, they can increase their bet up to and including the amount of their initial wager. Once the player has decided on their bet, the third card is dealt. If the card matches either value of the first two cards all falls outside of the spread, then the player loses the wager. The simplest strategy for succeeding at Red Dog is by following mathematics, with an advantage gained over the house when the spread between the two initial cards is seven or larger. Therefore, it is recommended to always raise the bet when this occurs and to simply play the hand when the spread is less than seven. By following this tip, the house edge for the game is reduced to around three per cent. 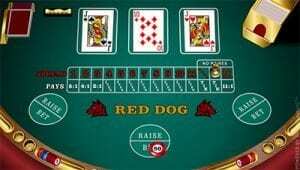 Software giant Microgaming has developed a version of Red Dog which could compete with any land-based casino. Offering both free-play and real-money, the game is very easy to understand, with cards dealt by clicking ‘deal’ in the bottom right hand corner of the screen. You can then choose to ‘raise’ your bet if you think the third card will fall between the initial two cards, or select ‘call’ if you think it will fall outside of the first two cards. The graphics are top-notch, with the lack of music and colourful flashing symbols, like you would find playing online pokies, offering a distraction free gaming environment which allows players to focus on the game itself. The game plays seamlessly, with the cards dealt quickly and, because it is produced by Microgaming, we know it plays fair and is a reputable game. Betsoft and Net Entertainment also offer versions of Red Dog, with NetEnt’s single deck game also encompassing a progressive betting feature which allows players to keep their winnings on the table for the next hand. Where can I play Red Dog online? Now that you know the basics of Red Dog, it’s time to have a crack at it yourself, however finding reputable gaming websites can be a daunting task, especially when you want to play for real-money. But we have researched the best online casinos offering Red Dog to play, all of which have in place the highest safety measures to ensure your personal and banking details are secure at all times. Additionally, all of our recommended online casinos also offer sign-up bonuses, giving you extra cash to play with upon making your initial deposit. Our top-rated casinos to play for real-money are listed in the casino table above. Raging Bull Casino is our top-rated casino site for players from United States, which hosts a range of table games, available for instant-play.